David Cohn, our Carnival of Journalism ringmaster, has graciously allowed me to serve as host for this month’s #jcarn blogfest. Take the prompts in whatever direction you wish. I’ll start gathering the results the week of June 25 and post a compilation post the first week of July. I’ve jotted down a few thoughts below. Today’s media environment is a flood of immediacy. With the focus on virality, content creators frantically update to ride the waves of Google, Bing, and Yahoo. They hope their content will light up the social-media landscape on Twitter, Facebook, and Google+. They crave the buzz that may last an hour or two or perhaps even a day, if they’re lucky. To that end, they often gauge success in terms of page views or unique visitors, largely because today’s advertising metrics are still focused on exposure. It concentrates on the actions of the audience, instead of the inherent quality of the content itself. We default to these measurements because they make sense. They are something that we can move. And they are something we can tangibly connect to revenue. These metrics remain a work-in-progress in various News Corp newsrooms globally but, eventually, will be the primary focus of how we need to manage our newsrooms and news publishing companies when it comes to audience data. But exposure is limited in what it tells us. 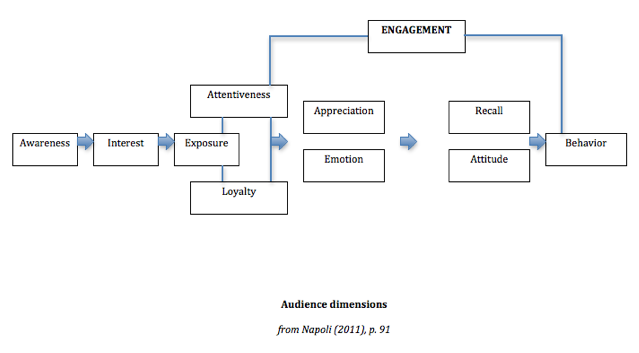 Most engagement models (such as the definitive one from Philip Napoli’s book Audience Evolution that I’ve included below) place the concept at the beginning stages of audience connection and participation, as measurements such as page views let us know only whether visitors saw the content. They don’t reveal deeper reactions. My research partner Dr. Carrie Brown-Smith and I have spent years working with traditional newsrooms moving to the digital realm, and we’ve chronicled a clash of ideals related to the energy spent on generating large numbers of page views. Since we first connected with the Christian Science Monitor in 2009, we have heard reporters and editors struggle with exactly how to define engagement. Is it loyalty in the form of return visits? Is it regular visitors to the home page? Is it someone who shares content elsewhere as a word-of-mouth advocate? What’s interesting is that the SEO side is a lever you can pull. You know how to work it, or we’ve figured out how to work it. We know if we do X, then we’re going to get Y, just like a machine, spit it out. We have no idea how to do the other one, so we’re just blind and fumbling around in the dark. And I think sometimes there’s a frustration that comes with that, so when in doubt, go back to what you know. But, yeah, if we could pull that lever, that would be great. I’m not sure we know how to do it. We are not the only industry watchers who have sensed a critical point in the conversation on metrics. Poynter’s Rick Edmonds noted in March that several corners — including the metrics firm Chartbeat — have begun exploring concepts that better capture what it means to have an engaged user. Nicholas White, editor-in-chief of the Daily Dot, told an audience at this year’s International Symposium on Online Journalism that the site doesn’t look at traditional metrics such as pages per visitor anymore. “We’ve gotten past (that),” he said. Authors Henry Jenkins, Sam Ford, and Joshua Green dug into this idea with their notion of “spreadable media,” from their book of the same name. They took issue with the label “viral,” which removes the human component from the action of sharing. “Spreadability” refers to the technical resources that make it easier to circulate some kinds of content than others, the economic structures that support or restrict circulation, the attributes of a media text that might appeal to a community’s motivation for sharing material, and the social networks that link people through the exchange of meaningful bytes. Our use of “spreadability” is perhaps most effective as a corrective to the ways in which the concept of “stickiness” has developed over time to measure success in online commerce. Another important distinction the authors made: Sharing doesn’t necessarily mean engaging. Perhaps users shared content to reveal something of themselves. Maybe it’s the headline that led them to post the article on their Facebook pages or in their Twitter feeds, and they did not truly engage with the content. For a while now, I’ve been mulling these related ideas and thinking about a concept that I recently started calling “longevity” — a piece of content that people return to repeatedly, whether for reference, connection, or enjoyment. It consistently draws users over weeks, months, or even years. It touches them on all levels: emotional, cognitive, and perhaps even spiritual. I first began thinking about this notion watching viral tweets, trying to determine what made certain tweets survive for more than a couple of hours through retweets and sharing. I began to wonder: Is it possible to create such long-lasting, meaningful content in a news context? Does everything have to be about immediacy? How do you think about meaningful content? Does it mesh with these definitions? And how might we define and measure it? Coming from a journalism background myself, Jonathan, I greatly appreciate your points here. Regarding “longevity,” I think that question of endurance of a text’s relevance is key. Some of the debates about Chris Anderson’s “Long Tail” concept certainly come in play here. Some ideas become hot for the week and then fade. Others remain consistently of interest over time. Some even gain new relevance years later. One of the challenges in the media landscape is, traditionally, a focus on an immediate ROI, which makes content longevity hard to invest in. But you could argue that the focus on complex drama does just that…in that it presumes that those texts will remain of interest over time. In the world of journalism, there was once upon a time a presumption that all stories were throw-away. An investigative story could take months to develop. But, if people missed the particular issue it was published in, that was it. Of course, the archival technology of the internet changes that considerably. Thanks for the response, Sam — all excellent points. I appreciate your comment bringing Anderson’s Long Tail into the mix; I find myself discovering some real gems buried in the depths of the Netflix catalog, and it leads me to share them with my networks. I suppose my meanderings here are a pushback against just how ephemeral our media have become — even on the big, important topics of the day. But you’re right. We shouldn’t expect everything to be permanent. There have been many news reports on the federal tax code since the 1986 reforms and everyone knows that the tax code has been repeatedly corrupted. But the voters have never done anything to stop Congress from creating at least one new tax deduction for every lobbyist with a campaign contribution. So all of the hard work by the many reporters was an almost complete waste of time. Their only positive accomplishment was the money they earned for entertaining both voters and politicians with gotchas. Which is why reporters are failing to communicate. They are entertaining customers instead of educating voters. But reporters are not interested in communicating more effectively. Their real goal is to feel self-righteous on a daily basis. They prefer entertaining customers with exciting stories because it makes their job more exciting. Reporters are so used to seeing themselves as the people in white hats that they have forgotten that white is also the color of toilet paper.